According to a new report from BRP, rapidly evolving customer expectations are driving a major transformation in retail. 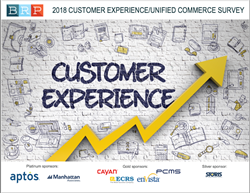 The 2018 Customer Experience/Unified Commerce Survey combines research on customer expectations with survey findings on retailers’ current capabilities and future plans to highlight areas of opportunities for retailers. As consumers will often stop shopping a brand after just one bad customer moment, it becomes critical for retailers to make the shopping experience seamless and frictionless. BRP’s 2018 Customer Experience/Unified Commerce Survey of top North American retailers offers insights into retailers’ current priorities and initiatives as digital and physical retail environments converge to facilitate a seamless experience across channels. The report also compares retailers’ priorities with customer expectations – based on recent results from the 2018 Retail Consumer Study conducted by Incisiv and sponsored by BRP and Windstream Enterprise – to understand how retailer priorities align with customer expectations. 1. Educate – Customers start the purchasing process by researching the brand and products so it is critical to ensure they and the store associates have information and tools that are easy to access and use. 2. Engage – The first step in customer engagement is to identify the customer early in the process and offer associates the ability to leverage customer information to allow personalized interaction. 3. Execute – To meet and exceed today’s elevated customer expectations, retailers must deliver unified commerce capabilities and empower associates with the right tools to optimize the experience. 4. Enhance – Gathering feedback to understand customers’ likes and dislikes allows for a continuous improvement loop and helps empower associates to create a desired customer experience. 5. Enablers – Delivering a personalized customer experience requires the right technology and network.